Indigenous people are on the frontline of climate change. They live in parts of the world where its impacts are greatest and depend largely, or exclusively, on the natural environment for their livelihoods, culture and lives. Indigenous people are also threatened by attempts to stop climate change. In the Arctic the ice is melting and the lives of the Inuit are dramatically changing. ‘It has become so serious that several coastal villages are now actively trying to figure out where to move entire communities,’ says one Inuit leader. In the Amazon hundreds of tribes are predicted to suffer from less rainfall, more droughts, and higher temperatures. 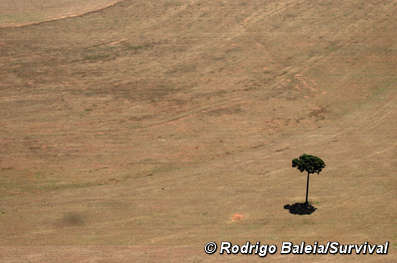 In 2005 there was a severe drought, leading to several Amazon tributaries drying up. Equally important, but barely recognised, is the impact that measures to stop climate change are having, or may have, on indigenous people. These ‘mitigation measures’, such as biofuels, hydroelectric power, forest conservation, and carbon offsetting, violate indigenous peoples’ rights and make it easier for governments, companies and others to lay claim to, exploit and, in some cases, destroy their land – like climate change itself. The Guarani in Brazil are losing their land to sugar cane to be turned into ethanol as part of attempts to ‘green’ Brazil’s energy resources and fight climate change. The Ogiek in Kenya have been told to leave their homes in the Mau Forest for conservation purposes. Kenya’s prime minister has cited the evictions as a key way to ‘reverse the ravages’ of global warming. Indigenous people all over the world are threatened by global schemes to stop deforestation and which could spark massive land grabs. One of these schemes, ‘Reduced Emissions from Deforestation and Forest Degradation’ (REDD) does not acknowledge indigenous peoples’ rights to give their full, prior and informed consent to projects on their land.